Robert Fanning’s Prophet is everywhere, watching us, observing us, viewing us in all of our clumsy, indelicate moments, in all of our foibles, faux pas, obsessions and passions, all the while making pronouncements that no-one hears, much less pays heed to. Yet, despite his ineffectuality, the Prophet is endearing—a persona unlike any other in poetry today. So compelling, in fact, that it is never quite clear whether Fanning’s third collection, American Prophet is the poet’s glorious creation or the Prophet’s poetic manifesto. It would be nearly impossible to discuss American Prophet, the book, without spending an inordinate amount of time reflecting on the Prophet. The Prophet appears in all 36 of the collection’s poems; this collection is his collection. Let there be no mistake, however, without Fanning as the puppet (poet) master, putting his character into situation after situation, setting after unique setting with skill and aplomb, there would be no record of the Prophet’s remarkable journey. Only a poet intent on painting the most vivid picture imaginable could create such musical imagery as “through shredded sails/ of cirrus.” Repeat that line aloud and watch those thin, wispy clouds drift before your eyes. Just as his protagonist is multi-faceted, so Fanning is a poet of many talents, achieving that rare blend of storyteller, cultural observer and master of language, all the while wryly admonishing us for watching bad apocalyptic movies and, like the townspeople in “The Prophet and the Symphony of Broken Horns,” tuning in to “lite ballads/ and one hit wonders,” blindly bopping to radio pop. Ironically (or is it? ), Fanning chooses to display some of his most artistic talent among the big-box store aisles in “The Prophet at the Superstore.” Who but a comic genius calls Wal-Mart or any of its brethren superstores a “fluorescent cathedral, ” or yokes together the disparate images of house of worship aisles into a poem where “the Prophet’s lost/ in the walled maze of aisles” and later, ominously, “the aisles begin/ to darken.”? Who among us, after stepping foot into one of the great marts, has not felt deep in our hearts as the Prophet does, “there’s a war.”? It may be just a “laser-guided fireworks display,” but in Fanning’s skilled hands, we are shown a frightening display of what our lives are really like. For those of you who did not stop to read the poem titles before embarking on the Prophet’s pilgrimage across these United States of pop culture, it becomes a sort of game, guessing where our intrepid guide will show up next—a pseudo-biblical Where’s Waldo, including visits to an Elvis impersonator concert, the dry cleaners, a casino, a barn purported to hold the face of Jesus in its beams, a superstore, a traffic jam, a war zone and, of course, a poetry reading. After all, a prophet’s role is to effect social change through traveling with his divine message. What better way to reach 21st century humanity than a journey to the local Wal-Mart? she tells him the price he will pay. as, hallelujah, the lights blink on. Though neither glorious, nor victorious, the Prophet is always endearing. 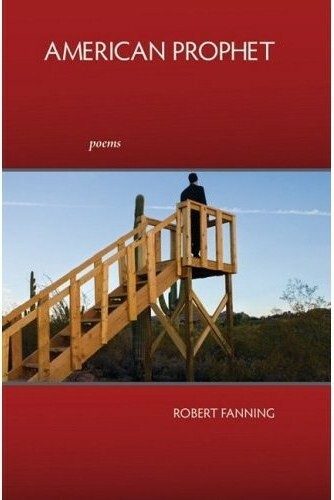 Robert Fanning, his mouthpiece, is a deft poet and skilled narrator. Readers will have little choice but to follow the pair to the conclusion of their poetic journey, back at the dry cleaners where the Prophet “hangs / his black suit on the hook and waits…,” where his suit is removed “like a superhero’s cape or broken wing,” where he wants to, but does not, say, “every face we wear/ is a withering disguise…” and where the Prophet leaves with a ticket in his hand, leaving us to wonder (to hope), will he return?